Latent Tamadras are a new (and expensive) way to add small amounts of power to your favourite monsters through latent awakenings. Latent awakenings are a new type of awakening that is independent of your monster’s normal awakenings. Each monster can have a total of 5 latent awakenings that can be customized to your liking. Feeding a 6th will replace the oldest awakening as you can only have 5 total per monster. The benefits are very small and are based on your monster’s base stats (excluding plus egg bonuses). Therefore, it is ideal to place latents where they will give the most benefit. For example, a monster with naturally high HP will benefit the most from HP Latent Tamadras . With the introduction of PreDRA Infestaion, all players now have an accessible means of farming Latent Tamadras. Currently, all of the latent tamadras can be farmed as a rare invade in descends, technical dungeons, coin descends, or PreDRA Infestation with the exception of skill delay. The 1% resist tamadras are available through the 5×4 descends featured in the coin dungeons. Please refer to my previous Guide for further strategy and my 5×4 team compositions post for more information. When deciding whom to place your Latent Tamadras on, you need to determine if it will be beneficial and if you will be using that monster long term. You are able to overwrite latent awakenings, but you will lose the those awakenings if you feed beyond 5 starting with the first Latent Tamadra fed. Hit Point Tamadras are best suited for monsters with naturally high health. 5 HP latents provides an additional 7.5% health which translates into 300 additional health on a monster with 4,000 base HP. 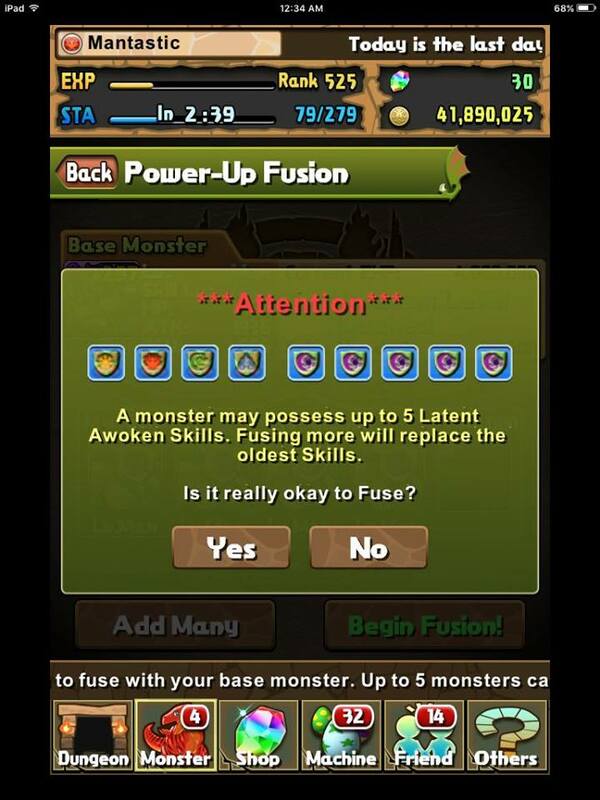 That is equivalent to 30 plus eggs and 4,000 base health is a good baseline to judge if you should give your monster HP latent awakenings. Furthermore, if that monster is on a team that multiplies your health, this can become significant as Awoken Idunn & Idunna gains 294 health which is doubled when paired with Ryune to 588. Attack Tamadras are best suited for monsters with naturally high attack and multiple two prong attack (TPA) awakenings. Each TPA awakening adds 50% damage per awakening and having at 2 adds 100% damage for that monster. When combined with 5 attack awakenings (+5%), your monster gains a modest damage increase (compared to non-latent awoken monster) that jumps per TPA awakening. A few shining examples of monsters who can greatly benefit from attack latents are Athena , Awoken Shiva , and Famiel who all have either high base attack or 2+ awakenings. In addition, monsters who possess the God Killer awakening such as Awoken Lucifer will deal significantly more damage to god type bosses. Recovery Tamadras are ideal on monsters who have naturally high recovery or actives/leader skills that base their strength on their recovery. For example, Light Metatron gains 173 recovery and this in turn increases the healing from her active by 1,038. In addition, any high base recovery monster that is used on teams that boost recovery will significantly increase your healing potential. Recovery latents are best suited on monsters with high base recovery. Unfortunately, the autoheal provided is less impactful than the RCV latent not only because of the smaller percent benefit, but because when matching heart orbs, you will experience an even greater rate of return. Using Gabriel who has 723 base recovery, he will provide 108 auto healing on every match. Whereas if he had RCV latents, he would provide 145 additional healing. However, when matching heal orbs, you gain 25% additional healing per combo matched. Therefore, if you matched 3 hearts along with 4 additional combos, you would heal 290 health. This is further increased if is used as a sub on / teams who augment recovery. Time extension awakenings are best used on monsters who have balanced stats and are used on a combo-heavy team. With 5 time extend awakenings, you gain 0.25 additional seconds to move orbs. When paired with a friend with the same latent set up, you gain 0.50 seconds. At this point you can notice a significant difference and are more likely to match that extra combo needed to trigger your multiplier. Some people debate on the viability of using time extend, but sometimes you simply do not have enough time to feasibly match your required combos. One popular lead to utilize time extends is Awoken Sakuya as her scaling multiplier requires at least 7+ combos matched to deal significant damage. 1% damage reduction latents are best used on your most important monsters who will always be featured on your favourite teams. These Tamadras contribute 1% resistance to that particular element and can be stacked. Thus, if you had 1 of each resist, you would be immune to all 100% gravity attacks as you will survive with 1% health. The most popular strategy is to stack the dark resist as a means to survive Divine Queen Hera’s large pre-emptive attack for Arena or Challenge level 10 dungeons without bringing a shield. This essentially requires your entire team to have this awakening and is far too costly for the average player. When the 5×4 coin descend comes into rotation we are able to acquire a few, but it would mostly be for helping to mitigate some damage from the scariest dark monsters. For more reading on viable teams that can clear 5×4 descends, feel free to read my discussion HERE. As to strategies to employ, you should always rainbow resist (put 1 of each resist on a single monster) a single monster who will be used all the time. With your left over latents, I would begin to rainbow resist the rest of your team, but with dark being the final one used. You can also do any other arrangement of 1% resists, but always keep dark as the final one. Overtime, you can then begin to override the other colour resists with 4 more until you have a monster with a full 5 dark resist. Outside of that, it is very niche in placing specific colours as every team is different although you can always place your elemental weaknesses as a means to mitigate damage from those floors. For example, placing wood resists on a mono blue team can be effective. Lastly, some players argue the validity of placing a full fire resist set on a monster as a means to mitigate the damage from the Arena Kalis when below 50% HP. This can be helpful, but not always as impactful compared to dark resists in most scenarios. Skill delay latents are best used on either monsters with haste (thus able to use their active to recharge the rest of your team) or monsters with critical life saving actives. This only effects the monster with the latent awakening, not the entire team and only resist 1 turn per awakening. For example, Yomi Dragons can greatly benefit from as their active provides 1 turn of haste. Thus your team would have to wait 1 less turn to use their active or you can use the generated hearts and dark orbs to sweep the floor or heal. Conversely, some players may find benefit on placing on their emergency spell characters as a way to use a defensive active to survive the subsequent turns. This could potentially be the full board change of Light Kali or the shield of Indra . Regardless, it is very costly at 30k MP per awakening and you should think carefully before investing in these latent awakenings. Overall, latent resist Tamadras are small ways to increase the potency of your favourite monsters. They are not mandatory for most of the game’s content and only shine when pushing through end game dungeons. However, if you are fortunate enough to have spare Monster Points or lucky enough to encounter in a dungeon, use them wisely.